From the end of last week academics at Universities all across the UK have gone on strike to protest at a proposed slash to their pensions. There are very many people who have studied this in a great deal more detail than I have and it is certainly a complicated story. A good place to start is the work of Mick Otsuka in setting out the problem in all its gory details. However to cut a long story short, the USS which is the pensions fund for lecturers is suggesting that they cut the level of pensions promised to lecturers based upon a risk assessment process which assumes that every single higher education establishment which signs up to the pension pot suddenly goes out of business simultaneously. Since this is clearly ridiculous, the only reasonable interpretation of their actions is that they are greedy and they are trying it on. I am one of those people cursed with the ability to see both sides of an argument. On this occasion, I can see no reason at all why the proposed changes are reasonable – it looks like a straight forward cooked up money grab so that those people who view universities simply in terms of the bottom line of a financial spreadsheet can make that number a little better. Their proposed changes would drastically reduce the level of pensions paid to University lecturers upon their retirement, the University lecturers are not happy about this and so we are currently on strike. When you go on strike, you don’t get paid of course. However in some sense the worse thing is the effect upon your students. This term I am teaching projects but I am not teaching actual courses, so it is a lot worse for my colleagues than it is for me because they have to decide whether or not they withdraw the teaching of actual courses, which effects many more students and cannot really be made up for. So why do the lecturers feel motivated to strike given the adverse effect it will have upon their students? If you undertake a career in academia, you have to put yourself through years of uncertainty. You have to do a PhD, and then you have to do multiple postdoctoral positions, (at each stage probably moving country in my field). At each stage, many people drop out of the process and only the most stubborn and lucky people (or occasionally, sometimes, the really gifted ones) make it to the place where they can get a permanent position. Their reward for dragging their family and their life around for more than five years? Well it certainly isn’t a huge salary. My PhD students who quit the field for finance or, more recently, big data regularly inform me that they are earning more than me within a year of their leaving academia. Why then do academics remain academics? Well of course there are advantages to the lifestyle. I get to decide what research I do, I am in a sense my own boss. This sometimes has its own stresses associated with it – I have no inbox, I have to invent my own inbox and sometimes that makes me question whether I am putting myself under enough pressure. However on the whole, I am very lucky to be in that situation. In return I have to teach, which is not a bad thing. I don’t have to teach all the time and on average it is a pleasure to pass on the skills I have developed by doing research to younger people who are motivated by science. I like students a lot, on average they are amazing, intelligent people, spending time with young people is a pleasure (they have a lot of energy which is infectious) and I often see my younger self in them. Often much more than my younger self. What I teach them is what they need to know to become physicists and/or to solve problems, it is often not what they think they need to know and it is based upon my years of research experience. It is very different from what they would get from someone who was purely a teacher. With the level of skills that I have developed over the years I could have done multiple things, most of which would have resulted in my salary being significantly larger than it is with me being in academia. However generally academics don’t worry about this too much because there are two things apart from the academic freedom I already mentioned which add to the equation when trying to decide whether to make this compromise or not – the pension and job security. Since I have been a permanent academic, I have come to realise that my job is not as secure as I thought it was – a few years ago the College closed down the school of physical sciences and engineering and opened a new school of natural and mathematical sciences in order to get rid of the engineering department. There was a “new” physics department and there was a job for me in it, but the stress that we all went through during that period was extreme and is something I will never forget. Now they are trying to reduce our pensions, again, having already reduced them a couple of years ago and promising not to do anything with them for a long period of time. At some point, one has to ask oneself, why should academics come to work in the UK? Of course anybody reading this who believes in the free market would say that I should vote with my feet and leave the country. There are indeed many postdoctoral researchers who would like a “permanent” position in the UK and lets face it, some of them are very good, and they are now cheaper than me, because I’ve been here for a while and I’ve been promoted. However, theoretical physicists, while often being quite naive in a frustrating head-in-the-clouds kind of way are not completely stupid. If the powers that be (Universities UK and University vice chancellors) continue to allow our job security and our pensions to be eroded, the equation will simply not add up in the UK, and people will eventually start to avoid the country. Already academics in the US or Switzerland earn a lot more than we do, even PhD students have started to choose those countries over us on purely financial reasons. On Halloween, someone somewhere decided it was dark matter day. That’s fine by me, I spend a lot of time worrying about dark matter and anyway, it had been a long time since we had done any outreach activities, so we arranged an evening talk. Myself, John Ellis and Chris McCabe spoke about Why we need dark matter, What it might be and How we might detect it. The talks went well and there was a really good question and answer session at the end where there were excellent questions. The picture on the left is John explaining the different symbols on his tank top, (it is the standard model of particle physics). It might appear to the casual reader that we’ve been inactive here at the KCL telescope over the past few months. This is not true, we had a very successful project with UG students over the Spring where they did lots of image processing coding and some fixes to make the dome rotation more stable. And we’ve had trips to to the roof for UG students, maybe I’ll post some images of those. “Composite” sounds like cheating and it is really, but its only two images on top of each other, a really short exposure to get saturn and a really long exposure (450 times longer) where saturn is massively over-exposed to get the moons. We got four tonight, Tethys, Rhea and Dione which are all quite small (about a hundreth the mass of the moon) and frankly not very very interesting unless you are very into these things. However we also got the mighty Titan – TWICE the mass of the moon with a thick atmosphere and hydrocarbon seas and a possible location of life outside the Earth. I hope to have more fun/cool pictures soon but if there aren’t, rest assured we are messing around with dodgy USB connections and remote telescope control and trying to find guide stars amongst the terrible London pollution etc. It hasn’t been a great year for the telescope, the weather has been pretty cloudy since the Summer, and when it has been clear, the pollution has been horrible. Let me be clear, not light pollution, but regular pollution. It has been really visibly worse than in previous years as has been noticed recently, even by politicians . So I went in last night with a student who has been helping me out called Imogen and she’d basically never been able to see anything in the three or so times she has been up, so we took pictures of the moon (literally the only thing visible, even bright stars were virtually invisible even through the finderscope, Deneb for example) and made them into a big photo. I have a 6 megabyte version but I don’t think the atmosphere was clear enough really for that to be worthwhile. So that’s a nice picture and something I’ve been meaning to do for a while. It’s actually about 20 pictures stitched together, each taken through a hydrogen alpha filter with an exposure of 0.2 seconds. It also gives me an indication of what it would take if I ever decided to get a nice picture of andromeda. Quite a lot of work! I don’t know what will become of things telescope related if the pollution gets worse. I can only hope for a few heavy rainfalls followed by super cold spells which might clear things up. Anyway, if it carries on like this, people in London will start dropping like flies, so hopefully things will change and we can get some nice images of stuff in space again. My main concern about the pollution is not actually telescope related! I have a four year old child growing up in this city, we are currently looking at which primary school to send him to. One on our list is Earlsmead primary school close to where we live in Tottenham. Nitrogen Dioxide measurements have been made there recently, it is site HR3o in this list. They show that the yearly average value of nitrogen dioxide is 50 micrograms per cubic metre. Meanwhile the European Union state that the legal maximum level of this gas is 40 micrograms per cubic metre. That’s not good, and its only one indicator of the problem. I don’t suppose any of the other schools in the vicinity close to roads (Risley Avenue, Harris Tottenham, Wellbourne) are much better, its just Earlsmead has a NO2 detector outside. I didn’t think I would be choosing schools on the basis of how to poison my child slightly less at one rather than another but apparently this is the world we live in. I think people need to be aware that London really is now reaching a limit of pollution which is untenable. At the very least, we need to reduce the number of diesel cars onto the street and of course ultimately the move to electric will improve things a lot. On that cheery note, I wish you a super solstice and a cloud free new year! Eskimo Nebula, obtained by undergraduates, this image processed by Alexandre Adler. First attempt at this object. Much room for improvement. So what I found out is that this thing is very small, but quite bright. So I should have used the planetary camera and 1×1 binning or something. I’ll try again. But you can just about see some details. This was the best version of the data that any of us managed to put together and Alexandre Adler did it. We should be able to improve on this significantly. Next, we tried to get Mars but it was a bad night. I am ashamed of this image, but its important to show how bad planets are from London when they are close to the horizon. Yes that’s it. Not great… and now Mars is moving away from us, so we won’t be able to get good images of it until 2018. Finally another image which is actually not so bad of The Whirlpool Galaxy. If you follow my twitter you’ve probably already seen this. 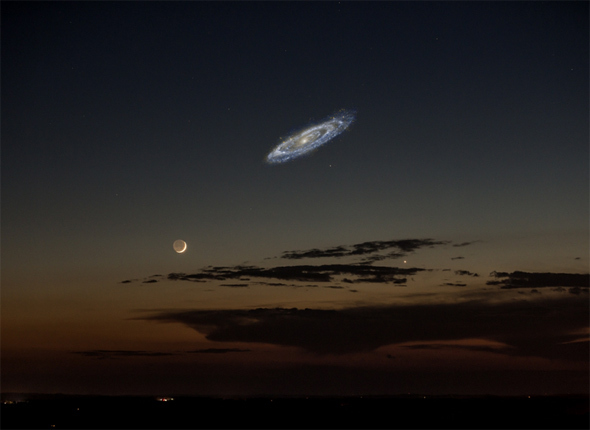 OK, so that’s not so bad, it actually looks like a galaxy. But the colours are a bit washed out, it appears to be green really. I need to learn some more tricks to bring out the different colours. This galaxy is about 7 Mpc away, so if we imagine shrinking the Universe, if we were 60 cm from the centre of the Milky Way, this Galaxy would be about half a mile away. I had hoped to go out tonight and get more practise but its not good weather. However I do think I have finally obtained all the hardware and software to guide the telescope with guide stars as opposed to just hoping it is tracking well, and I hope that will lead to much sharper images in the future, so watch this space.